I'm trying to insulate an aircraft's wiring from the rfi/emi effects of an HF antenna in a fibreglass Long-EZs wing. A counterpoise to the antenna will lie in the opposite wing. I had thought of using a grounded (?) copper conduit for all the wing wiring ... fuel tank capacitance gauge/strobe and navigation lighting/vhf nav-com cables, but with an output of 100W I am worried that the in-wing HF antenna will set up a field that will still cause issues. There is still the case of using a common ground for the existing wiring and the new radio causing problems. Any thoughts on a suitable insulator or solution to this? the antenna will lie in the opposite wing. that the in-wing HF antenna will set up a field that will still cause issues. There's a VERY high probability for that condition. but are okay when you're listening. and filtering local to the actuator. wiring and the new radio causing problems. and then attack each critical condition one-at-a-time. along the bottom of panel. have the unit in the tray yet. SL30 uses Archer wingtip antenna, 430 uses bent whip on belly. did not notice it in flight. to exceed the limit (35) which annoyingly gets my attention. copilot push to talk I get the same effects. grounds at forest of tabs and third wire inputs to EIS. Any ideas on how to limit this interference? Many thanks for your reply, informative as always. You're right of course ... if some gauges don't work while transmitting then that's not a real problem. And it's highly unlikely that I'll be transmitting on vhf and hf at the same time. But my concern is that while transmitting on hf that the induced field may cause some more long-term effects in these electrical systems. And also as the low end hf frequencies are getting closer to microwaves, I'm a little worried that the foam may get very hot and lose it's structural properties. Either way, I shall do as you say ... install and test. you'll be using, to see what disturbance is created to which systems. especially in a fiberglass airplane with fuel tanks in the same wing. than about 1/20 of a wavelength. unlikely that I'll be transmitting on vhf and hf at the same time. field may cause some more long-term effects in these electrical systems. I've got no reason to believe this is likely. antennas across a distance of perhaps 100 yards. You will be trying a new approach using the driven element in one wing and the "counterpoise" in the other. Frankly this sounds like trouble, especially in a fiberglass airplane with fuel tanks in the same wing. There is little difference between something you call a counterpoise, and for instance the nav light wiring, they all return to the ground point of the antenna tuner. You will have high voltages at some points on the driven element, and lots of opportunity for discharge through the fiberglass in the vicinity of the tank. 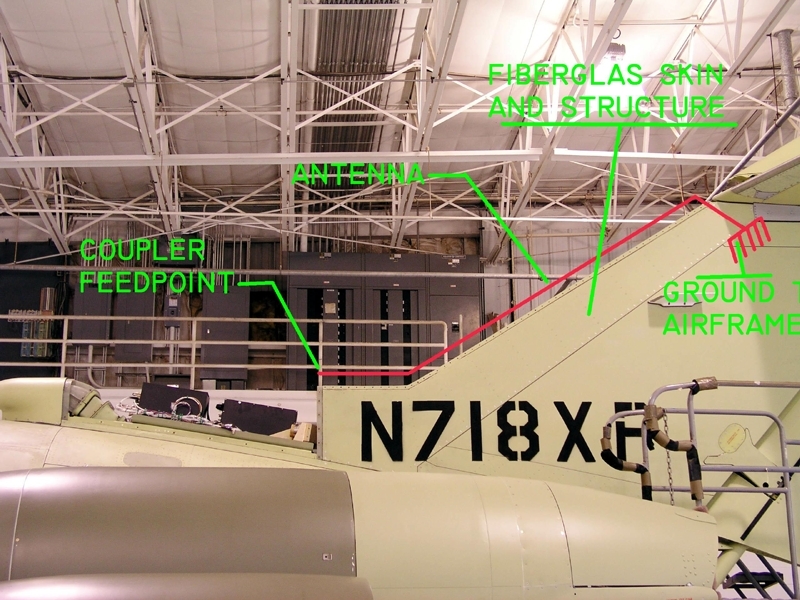 There can also be high voltage nodes on the "counterpoise" and on every other conductive part of the aircraft, because *all* parts of the aircraft will be part of the antenna. In a Navajo I worked on, we had arcing around one of the flap hinges at certain frequencies. power sources (including APU) while transmitting. by with a tiny fraction of the problems. H.F. performance on their airplanes. exciting it with a very agile antenna tuner at the bottom. was never designed to be part of an antenna ground system. had not existed before the antenna change. Managed to craft "special connectors"
sifting of cause/effect to deduce the effective band-aid. a really elegant solution may be unattainable.